Sony has announced the 18-135mm for its A-mount DSLT/R range and a new 18-200mm telephoto zoom lens for the NEX compact system camera range. First up, the Sony 18-135mm f/3.5-5.6 lens for A mount cameras offers an 8x zoom capability. Designed as a "go-anywhere" lens, Sony also promises that the optic has smooth, quick and quiet autofocus operation. Direct manual focus for fine-tuning is also available. Sony has also announced a new 18-200mm f/3.5-6.3 telephoto zoom lens to sit alongside its newly announced NEX-F3 compact system camera. The lens, which is a successor, but not a replacement, for the previous 18-200mm iteration, offers an 11x zoom range in a lighter and smaller unit. Approximately 12 per cent lighter than its predecessor, the lens is fitted with Optical SteadyShot, which is designed to compensate for the effects of hand-shake. Manual focus is also available for precise control. The new lens is aimed primarily at NEX photographers who like to travel with the camera, but Sony is continuing the previous version of the camera. Sony says that the original version is more suited to video recording, whereas this one provides a lighter option for those primarily using the camera for stills photography. 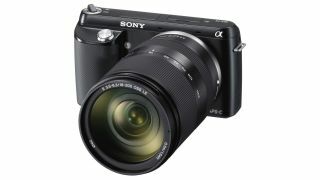 Launched at the same time as the NEX-F3 compact system camera, the price of the lens has not yet been made official.